An infection in your tooth can cause unbelievable pain and may even lead to a life-threatening tooth abscess. At Glendale Dental Wellness Center, Dr. Robert Sue offers root canal services, a treatment option that helps you preserve your natural dental structure and alleviate pain and swelling. Dr. Sue performs root canals in a comfortable environment and even offers sedation dentistry to ensure a relaxed dental experience. If you’re experiencing a lot of pain in a certain tooth, don’t delay treatment. Schedule an appointment online or by phone today. Why Choose Glendale Dental Wellness Center for Root Canal Therapy? A root canal is a common dental procedure that can help you save a diseased tooth rather than have it pulled. Your teeth contain pulp tissue that travels from the crown to the tips of the tooth’s roots. The pulp supports the growth and development of your teeth. When your tooth reaches full maturity, it can thrive without the pulp. A root canal allows for the removal of the pulp and nerves of the affected tooth to alleviate pain and prevent infection and abscesses. 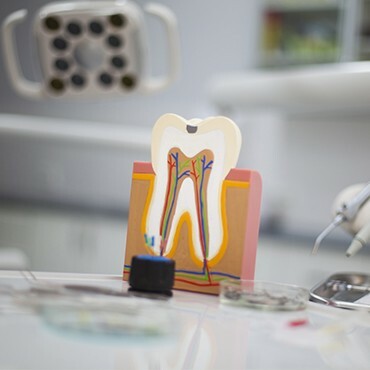 Dr. Sue may recommend a root canal if you have a deep cavity or a cracked tooth that allows bacteria to get inside the pulp tissues and grow into an infection. 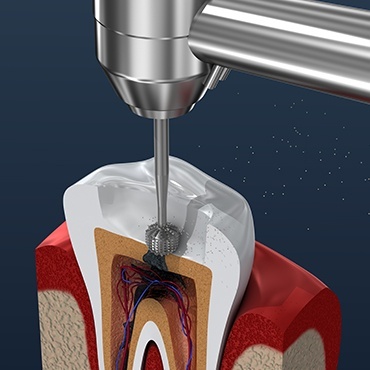 A root canal is an ideal alternative to having your tooth permanently removed. An untreated infection can turn into a tooth abscess, causing you considerable pain and facial swelling. If not treated, abscesses can get into your bloodstream and cause life-threatening medical issues. A root canal often requires more than one visit. During the procedure, Dr. Sue removes the nerves of the affected tooth. He thoroughly cleans and seals the treated tooth, then fills it with a dental composite to protect the tooth and restore its functionality. He will administer a local anesthetic to keep you comfortable during your root canal procedure. He also offers sedation dentistry services to ensure that the procedure is a relaxed and pain-free process. Once the anesthetic wears off, your tooth may feel sensitive for several days. If you have an infection or abscess prior to treatment, you may still have some swelling or discomfort in the affected tooth. Dr. Sue is likely to recommend over-the-counter pain relievers or prescription antibiotics following treatment to keep you comfortable. You may also need some time to get used to the composite filling in your treated tooth, as it may feel a little different than your other teeth. This is normal, but if you have pain or pressure that lasts for several days after your root canal, contact Dr. Sue’s office right away for assistance.